After the defeat of Germany, the Allied government began issuing stamps for use in the conquered area. At first, all of the occupied zones used centrally issued stamps, with the exception of those occupied by the French. The first of these stamps were issued in 1946, and they remained in use until 1948. There were also French zone issues that are highly collectible from this era as well. 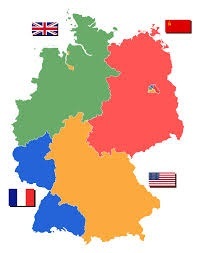 The areas were divided up as follows: America occupied Bavaria and Hesse, which is located in the southern portion of Germany, as well as northern areas of Baden-Wurttemberg, Bremen, and Bremerhaven. The British had control of most of Northwestern Germany, while the French were in charge of the areas of Germany that bordered France. In 1948, the governments of Great Britain, the USA, and France declared that they were introducing a reformed currency; this was met with a separate reform on the part of the Russians, and ended up in the combined issue being withdrawn. The development of the Cold War resulted in a failure to try and bring unity to the postal system. The American British Zone stamp initially just overprinted a pattern involving posthorns, but later a new design was introduced, which had the inscription of “Deutsche Post.” These stamps were used up until September of 1949, when a new Federal Government was finally formed. If you are interested in learning more about American-British zone stamp issues, then you can contact Treasure Coast Stamps directly. We can help you locate any stamps you might need to round out your collection, and we are always happy to talk to collectors who are as passionate about their stamp collections as we are.